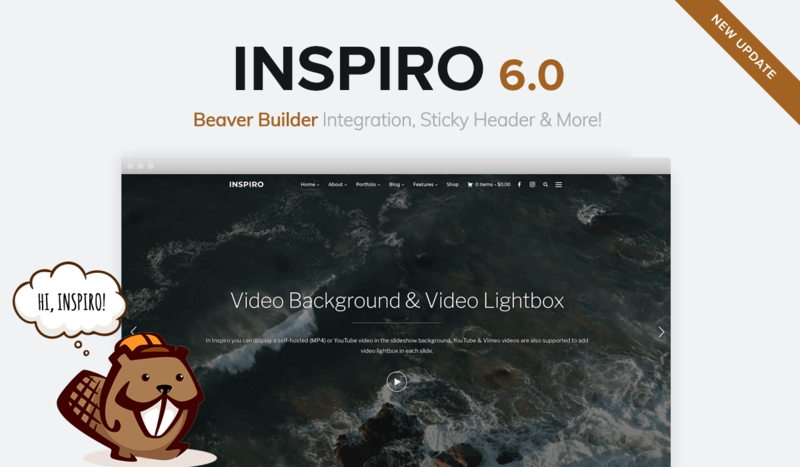 Inspiro 6.0 Released: Beaver Builder Integration, Sticky Header & More! We are very happy to announce that after several weeks of working on new features and many days of testing, Inspiro 6.0 has been released! You can upgrade now right from your dashboard, or download Inspiro 6.0 from your WPZOOM Account. What’s new in Inspiro 6.0? Why did we replace Unyson Page Builder with Beaver Builder? 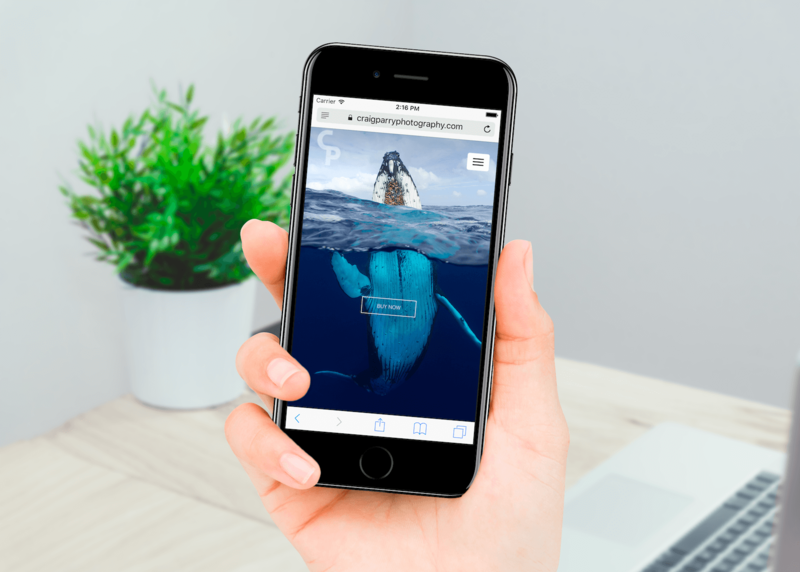 Two years ago, in Inspiro 4.0 we started to recommend to our Inspiro Customers the Page Builder from Unyson as a useful tool to create custom layouts when the widgetized page templates weren’t enough for their needs. Unyson seemed to us a good plugin at that time, and the team behind it was actively involved in the development process, but in the last months it looks that the plugin isn’t receiving any updates or support anymore. New bugs appear daily and in spite of it being used on 100k+ sites, we consider that it’s very unprofessional to ignore all the problems and use Unyson as a promotion tool for other products they’ve developed. At this point, we consider that our customers deserve a better Page Builder recommendation, and after testing and discussing with multiple plugin authors, we decided to go with Beaver Builder. We’ve been eyeing Beaver Builder for quite a time, and now it’s the perfect time when we’re confident that this is the right Page Builder that’s missing in Inspiro. 1. There’s a free version available – Beaver Builder Lite, which means that our customers won’t be forced to purchase an additional product in order to get the most from Inspiro. 2. Beaver Builder is a live page builder. No more building in the blind and guessing how the page will look after you save the changes. 3. It’s easy to extend it with new add-ons and templates by installing 3rd party plugins. We have even created our own free plugin named WPZOOM Addons for Beaver Builder, which will complete the free version of Beaver Builder with some useful modules for Inspiro and not only. 4. There’s a Beaver Builder Premium version available, which gives us the confidence that nothing similar to what happened to Unyson will happen with Beaver Builder and customers who really like this builder, can upgrade to a Premium version for even more features. Moreover, the team behind Beaver Builder is actively working on improving their products and we can be sure that they will be in the business for many years ahead. Beaver Builder is already compatible with the new Gutenberg editor, so what else do you need to be prepared for the future? 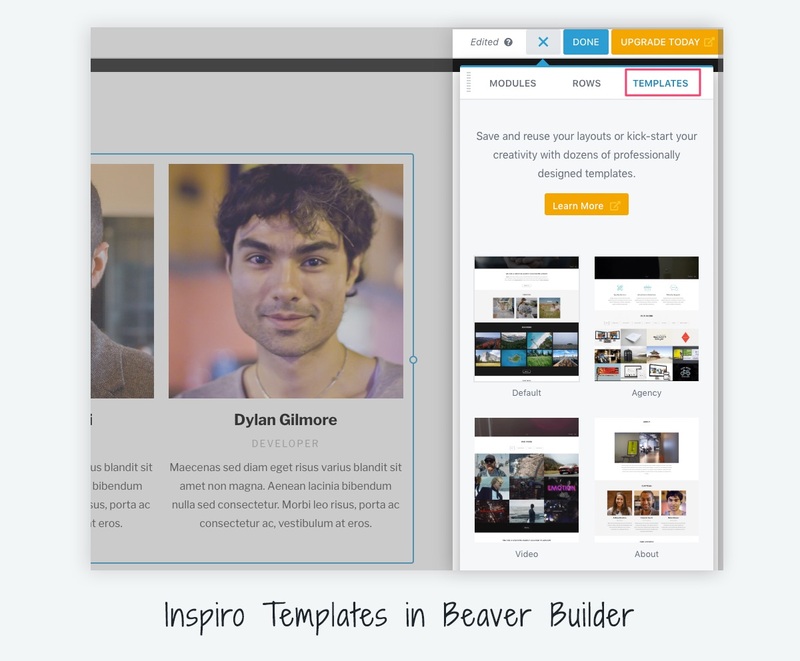 How is Beaver Builder integrated in Inspiro? When we say “integrated“, of course, we don’t mean that we bundled the plugin in the theme or something similar. We’re referring to the fact that we’ve made sure that new customers will be able to create everything they see in the demo using the free version of the Beaver Builder. This is possible thanks to the new free plugin we’ve released to extend the free version of Beaver Builder with new modules that allow you to create any kind of website: Testimonials, Team Members, Maps, etc. Do I Need Beaver Builder Premium? It depends! If you’re happy with the Lite version of the Beaver Builder, the theme will work great with it as it is. In case you want to unlock even more features, then you should definitely upgrade! EXCLUSIVE DEAL: All WPZOOM customers receive a $10 discount when purchasing a premium version of Beaver Builder. Find more details on the Deals page. You guessed it right! 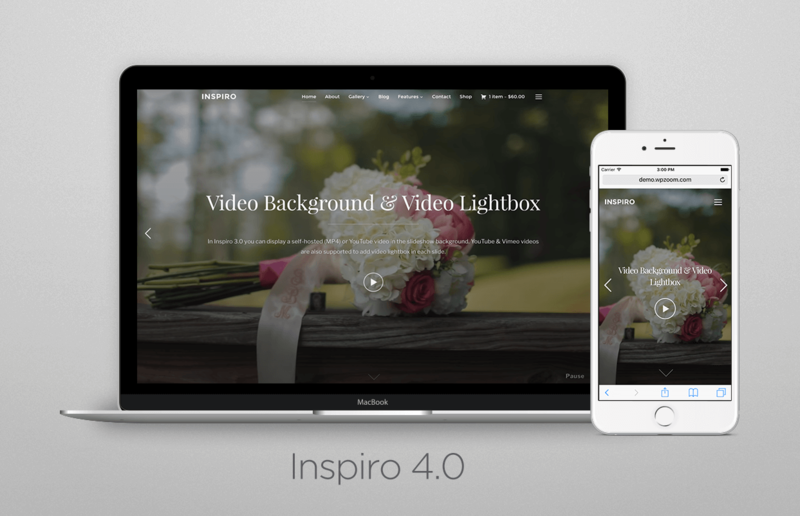 A new portfolio page template which is not full-width is now available in Inspiro. 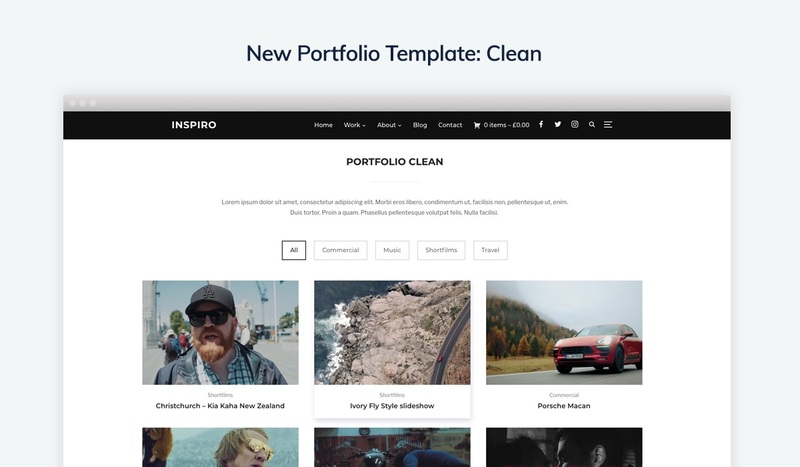 The new Clean Portfolio template will show the portfolio items in a wrap with the title will be visible below the featured image as opposed to other templates that displayed the title only on hovering. 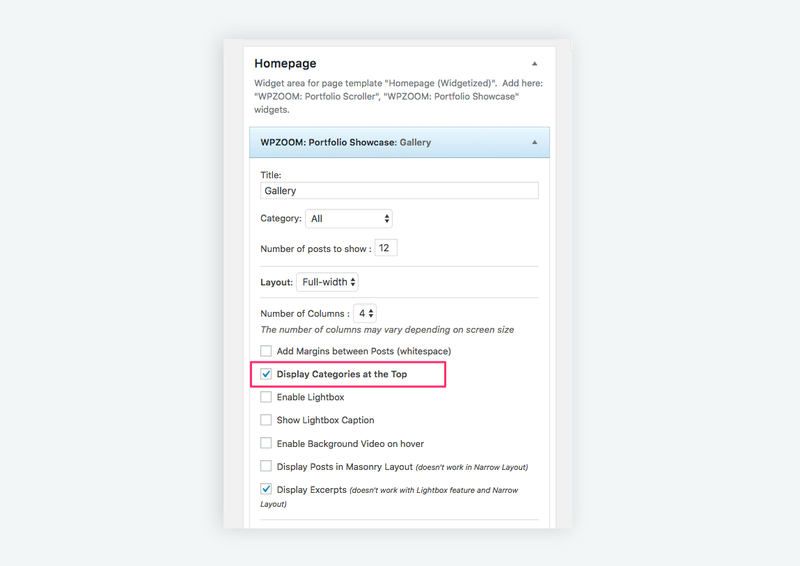 Another feature which has been requested a lot of times by our customers was to display the Portfolio Filters (Categories) in the Portfolio widgets on the front page and other pages created using the Page Builder. We’ve improved the Portfolio Showcase widget, and now it offers you an option to display the categories at the top, just like on the Portfolio page. The only difficulty that prevented us from making this option available a long time ago was the fact that in this widget users usually display a limited number of Portfolio Posts (6-12). This means that the chance to see no posts when choosing a category was very high. However, we’ve found a way to overcome this difficulty by implementing AJAX requests, and now the widget will display posts from a specific category even if they aren’t shown by default in the limited number of posts. See it in action in the demo. 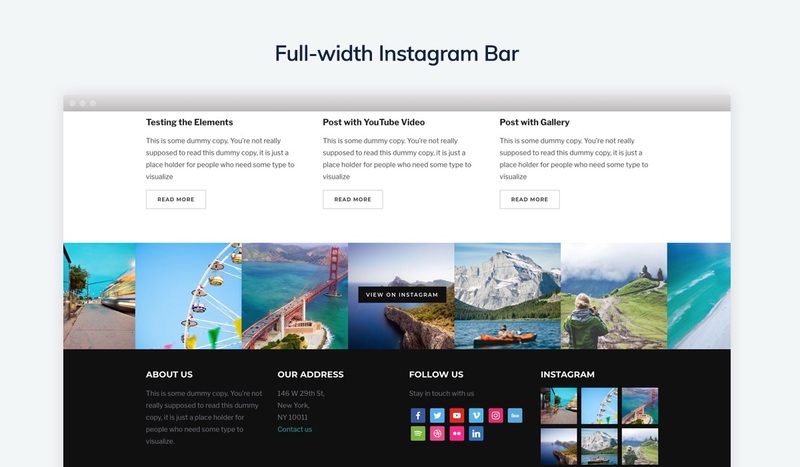 Instagram Bar in Footer – a new widget area is now available, in which you can insert our free Instagram Widget and create a full-width feed of your latest pictures. Sticky Header – no more need to use additional plugins to give a nice effect to the header menu. It will stick now the top automatically when scrolling the page. Portfolio Re-order – you can now change the order of Portfolio Posts in the gallery much easier from the page Portfolio > Re-order. Slideshow Image size was increased for better quality on retina devices, so it’s recommended to Regenerate Thumbnails. We’ve also made significant changes to the theme code and now it even includes the SASS/SCSS files, which may be helpful for advanced developers. Some changes have been also made to the theme design, so we highly recommend you to backup your current theme before updating Inspiro, especially if you have a lot of customizations. What happens with Unyson integration? If you’re using Unyson’s Page Builder in your website, then it’s optional for you to switch to Beaver Builder. Inspiro 6.0 will not affect any of your pages created in Unyson and everything will continue to work just like before. However, we recommend to migrate to Beaver Builder and re-build all your pages as we’ll stop supporting Unyson because it’s an outdated plugin and some things just don’t depend on us. Is there an easy way to migrate Unyson pages to Beaver Builder? Unfortunately, no. However, you can easily insert in pages pre-build layouts in Beaver Builder > Templates. 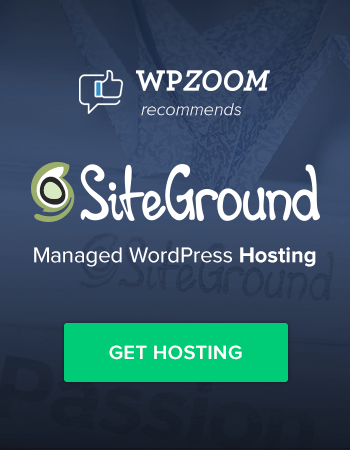 The new update is available for all existing customers, and if you have already activated your license key and enabled 1-click theme updates, head over to your WordPress Dashboard and update your theme. 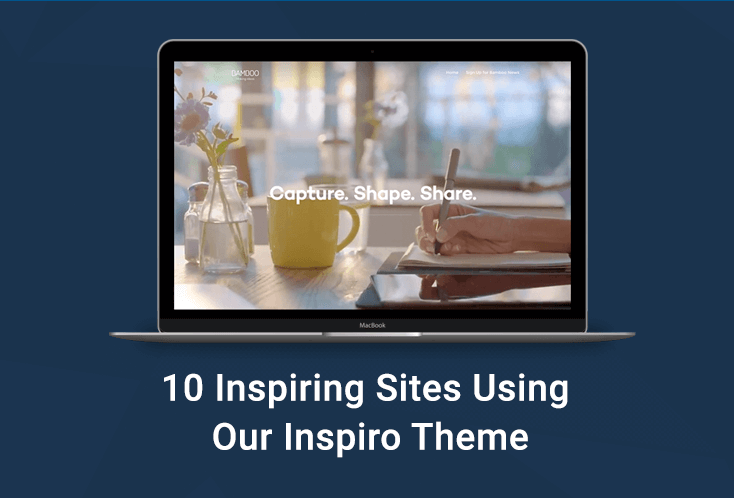 For more information about Inspiro 6.0 theme see the theme page or take a look at the live demo. Let us know if this update meets your expectations and what are your plans with Inspiro in the comments section! I can’t seem to get the Video Background on Hover to work on a new portfolio youtube video. The same video link works on a hover with the slider, but not as a portfolio. I have the youtube link in the field under ‘Video Background on Hover’ tab. 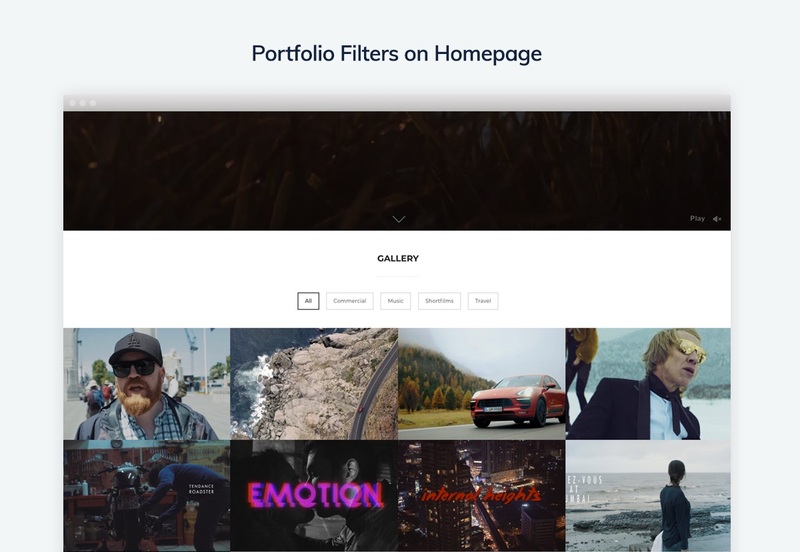 I also enabled the ‘Video Background on Hover’ within the widget Portfolio Showcase and tested this on both the homepage that is using the Portfolio Showcase and also the portfolio page view. The hover video background does work on the native demo portfolios where the video was uploaded to the web server.. It doesn’t work with the youtube video link.. except for with the slider. At the moment only self-hosted videos can be used for the Video background on hover feature. Is it possible to include a GIF image for the headers?